The stock market may be soaring to unprecedented heights, but things just continue to get even tougher for the middle class. In this economic environment, there is intense competition for virtually all kinds of jobs. For example, more than 1,600 applications were recently submitted for just 36 jobs at an ice cream plant in Hagerstown, Maryland. That means that those applying have about a 2 percent chance of being hired. About 98 percent of the applicants will be turned away. That is how tough things are in many areas of the country today. It is now more than five years after the great financial crash of 2008, and the level of employment in the United States is still almost exactly where it was at during the worst moments of the last recession. And this is just the beginning. The next major financial crash is rapidly approaching, and once it strikes our employment crisis is going to get much, much worse. 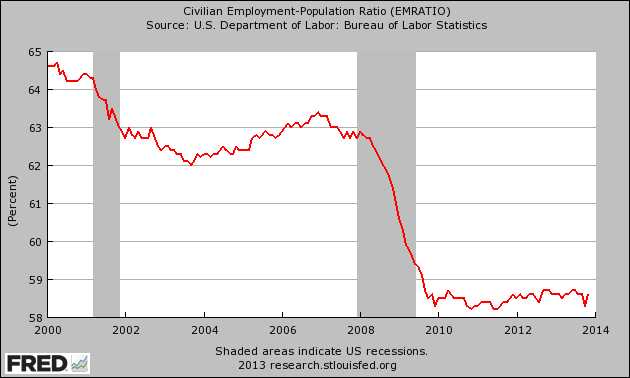 Anyone that believes that the economic crisis is "over" is just being delusional. It may be "over" for the boys and girls that work on Wall Street, but even their good times are only temporary. Of course most Americans are not fooled by the propaganda being put out by the mainstream media. According to a recent CNN poll, 70 percent of all Americans believe that "the economy is generally in poor shape". And according to another survey, the economy is still the #1 concern for American voters by a good margin and unemployment is still the #2 concern for American voters by a good margin. In other words, "It's the economy, stupid!" A startling number of middle-class jobs may be headed toward extinction. More than any other job class, mid-level positions have struggled to recover from the recession, and only a quarter of jobs created in the past three years are categorized as mid-wage. There are high-skilled professional jobs that require college degrees and low-skilled service jobs for less educated workers, but the middle is getting squeezed. As mid-wage jobs disappear, they are being replaced by low wage jobs. As I mentioned yesterday, one recent study found that about 60 percent of the jobs that have been "created" since the end of the last recession pay $13.83 or less an hour. And this is just the beginning of the decline of the middle class. Another great financial crisis is rapidly approaching, and once it arrives things are going to get much worse than they are right now. -"In 33 years of forecasting trends, the Trends Research Institute has never seen a new year that will witness severe economic hardship and social unrest on one hand, and deep philosophic enlightenment and personal enrichment on the other. A series of dynamic socioeconomic and transformative geopolitical trend points are aligning in 2014 to ring in the worst and best of times." -"Such unforeseeable factors aside, we forecast that around March, or by the end of the second quarter of 2014, an economic shock wave will rattle the world equity markets." -"Nearly half of the requests for emergency assistance to stave off hunger or homelessness comes from people with full-time jobs. As government safety nets are pulled out from under them – as they will continue to be for the foreseeable future – the citizens of Slavelandia will have no recourse but action." In what may be the bearish call to end all bearish calls, one technician believes 2014 will be the year of “major reversals,” with the Dow Jones Industrial Average expected to start a two-year decline that could eventually take it down more than 70% to below 5000. “Based on our longer-term time cycles the present stock market rally must be considered the bubble to end all bubbles,” Mr. Zimmerman wrote in a note to clients. He doesn’t believe the Dow Industrials will hit a long-term cycle low until 2016, somewhere in the 5770 to 4650 range. The Dow hasn’t seen those levels, which are 65% to 72% below current prices, since late-1995 to mid-1996. So what do you think the rest of 2014 will bring?